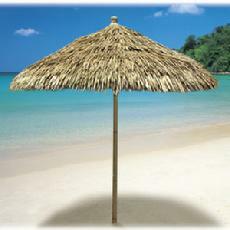 This tiki umbrella has definite island style with its thatched top! The pole is made from strong, sturdy bamboo. 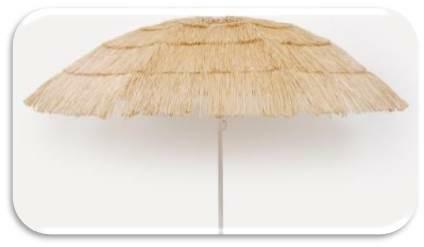 The thatch umbrella is available in your choice of three sizes. Note: If used outdoors, the manufacturer recommends applying a water sealant twice annually. Bamboo left outside will weather to a silver grey color. 5' diameter $199 Each with Free Shipping! 7' diamater $229 Each with Free Shipping! 9' diameter $249 Each with Free Shipping! Height from bottom of pole to top: 104"
Height from bottom to edge of thatch: 89"
Bamboo Selection "7 FT Bamboo"
Bamboo Selection "9 FT BAMBOO"
Ships in 24 hours Monday-Friday. We ship UPS so you get your order in 2-6 working days. Brand New and it Tilts! 3 1/2 inch circumference powder coated white 2-piece steel pole section. Pointed tip on bottom for easy use at beach or yard. 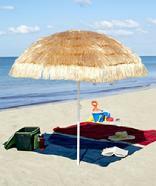 or make your beach or party into the center of attention! 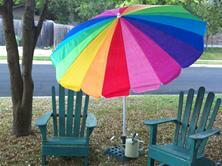 Color Selection "Rainbow Beach Umbrella Free Shipping"
Ships in 24 hours Mon-Fri. Ships Fed Ex so you get your order in 3-7 working days. This tiki beach umbrella features a polyester canopy. Have fun in the sun! In the backyard, on the deck, by the pool or at the beach, this tiki umbrella provides stylish shade. Overlapping layers of synthetic straw that rustle with every breeze.